Let's talk about last night. An amazing evening dinner in celebration of our beautiful and talented friend's birthday, Ceci Johnson of Ceci New York. It was an honor and a pleasure to design the evening's ambiance with Ceci's stunning creations accenting the decor. 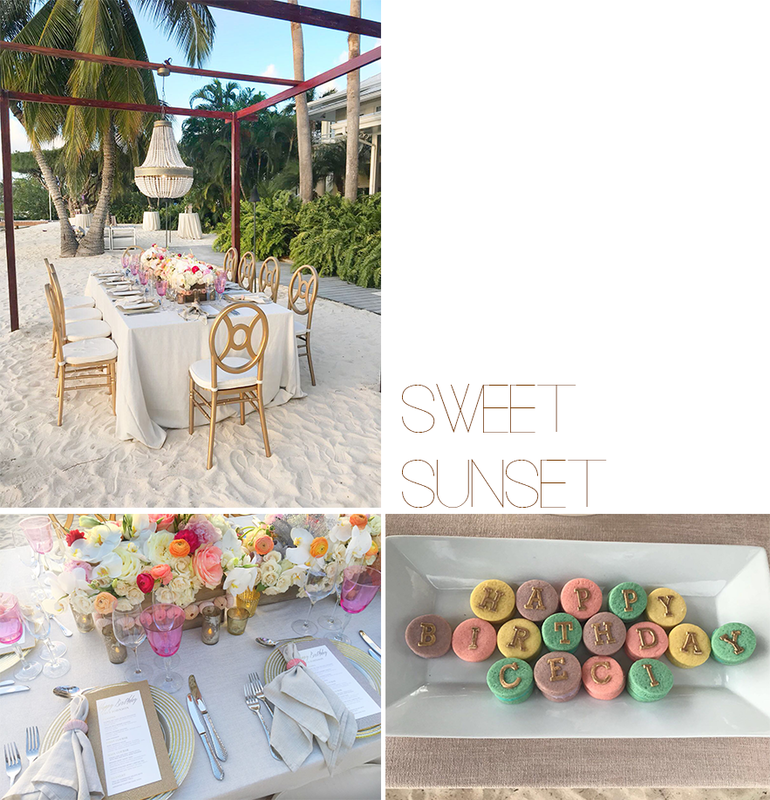 To top it all off, we had a magical location and dinner courtesy of Luxury Cayman Villas and their in-house culinary artist, Chef Vincent. 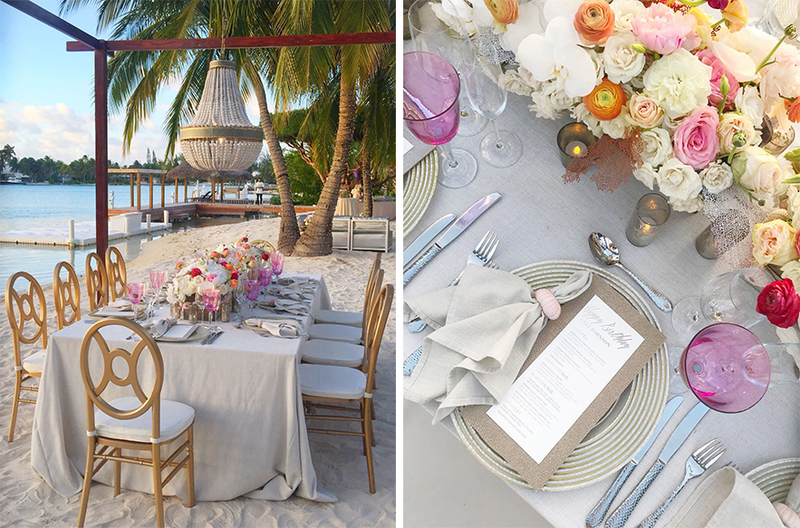 Celebrating in style, the candlelit dockside dinner took place at an exclusive Rum Point LCV property, KaiKu. 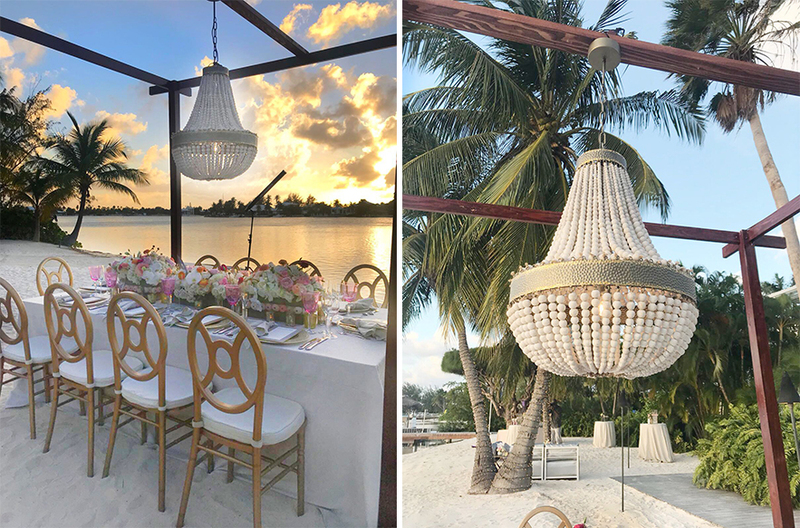 Overlooking the calm waters of the Island's corner, a concave at Cayman Kai with a bay that scoops a silent dose of the ocean for the ultimate dinner party setting, the waters sparkled to the tune of the rustling palms in the evening’s warm breeze. 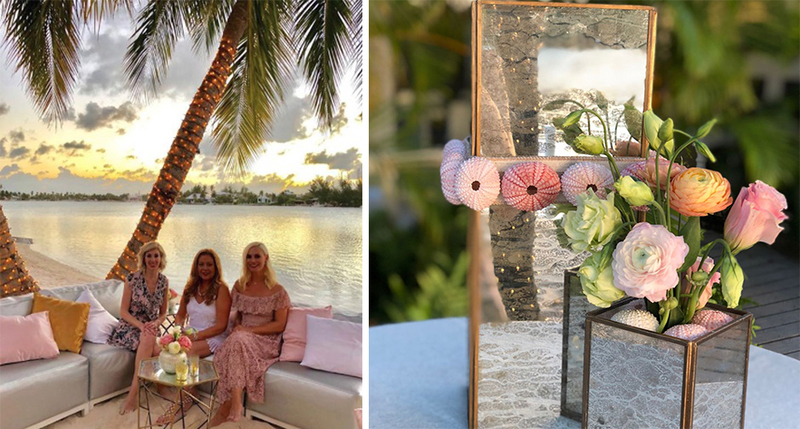 A few sips of Dom and a dose of LCV's signature cocktail (a watermelon and coconut concoction to die for) over a shimmering setting swept us into an evening of anecdotes and surreal moments of reflecting on the beauty and luxury of the Cayman Islands. Our decor style for the evening, aptly named 'Sweet Sunset', laid out an ambiance of sandy hues and blush compliments, with ocean inspired finishing touches via ethically sourced seashells and sea fans emerging from the crate-held florals of garden roses, peonies, ranunculus and cascading orchids, all beneath a sea-kissed chandelier of wooden beaded droplets. 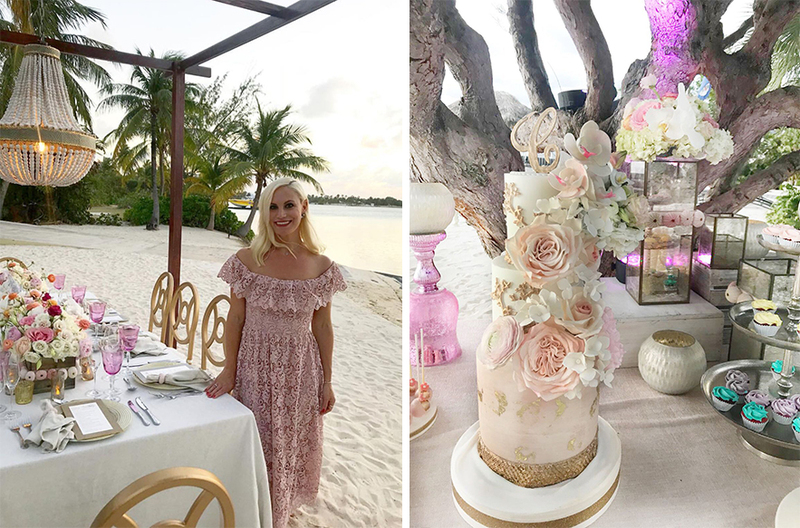 A truly delectable end to our ‘Sweet Sunset’ dinner came courtesy of our lovely cake-aficionado, Lori-Ann Foley of The Cake Studio. Setting a dessert table with her masterful collection of sweets artfully crafted for the evening, we were spoiled with selection in a series of delicately constructed confections and hand-painted cakes. 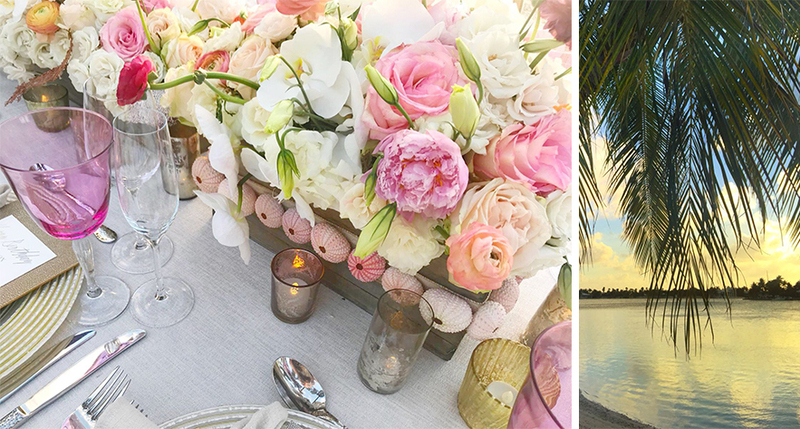 The evening closed with Ceci’s birthday wish, and while we’d like to reveal it all, we’ll keep this one a secret, hinting only that we all departed the ultimate setting in paradise with mermaid wishes and champagne dreams. Floral & Production: Celebrations Ltd.